An exquisite and extremely private âPeace of Paradiseâ best describes this pastoral 2 plus glorious acres & the 3685 s.f. Custom Built, John Cahill home. 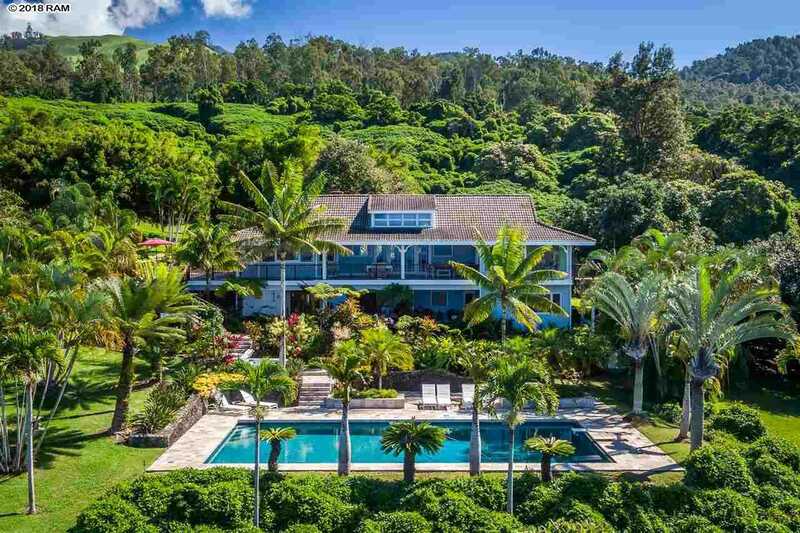 The drive along the road to Ulupalakua is magnificent in itself & by the time you pass through the gated entry to this lushly landscaped estate, you are feeling your 'inner peaceâ. Our Sellers have put their heart & soul into taking this property to the next level during their stewardship. Upon arrival you find an oversized 4 car garage plus extensive additional shop-space. As you pass under the garden trellis your attention is immediately drawn to the verdant hills in the foreground of the expansive ocean & outer island views across La Perouse Bay, the Island of Kahoâolawe, & Makenaâs Big Beach! The expansive 1411 s.f., Ipe wood, wrap around lanai, offers numerous areas for entertaining & exquisite star gazing! There are light-filled windows, skylights, & glass doors in every direction creating that special Maui experience of seamless indoor/outdoor tropical living. Rock Maple hardwood floors with Mahogany accents, stainless steel appliances, granite counters & back-splash, a lodge-like, river-stone wood-burning fireplace, the stunning, custom, barrel-vaulted, clear-cedar ceiling that arches seamlessly over the great room & the covered, view oriented, lanai speak to a level of detail that is inspiring. A resort scale pool is surrounded by mature specimen palms & flora, lava rock garden walls & an expansive quartzite-tiled deck pool area. The ocean view master suite enjoys a dedicated lanai & custom tile bath. There are 2 additional bedrooms on the main level, and a large bonus room & 3 additional sleeping areas plus a dry sauna on the lower level. The heavenly 1600 ft elevation is a perfect environment for the abundance of avocado & fruit trees on the property. This estate must be seen in person to truly appreciate. Please, send me more information on this property: MLS# 380681 – $2,998,000 – 515 Kini Dr, Kula, HI 96790.